1 package Knorr® Sidekicks® Chicken Pasta Side Dish, prepared according to package directions. 1 Grill jalapeno, turning frequently, until blackened on all sides, about 5 minutes. Wrap in foil and set aside 10 minutes. Rub off blacked skin, then halve, seed and chop; set aside. 2 Combine oil and Knorr® Chicken Instant Stock Mix in small bowl. Finely grate 1/2 teaspoon (2 mL) peel and squeeze 1 tablespoon (15 mL) juice from lime and stir into bowl. Brush mixture on zucchini and chicken. Grill zucchini and chicken, turning once, until zucchini is tender and chicken is thoroughly cooked, about 6 minutes. Cut into bite-size pieces. 3 Stir chopped jalapeno into prepared Knorr® Sidekicks® Chicken Pasta Side Dish. 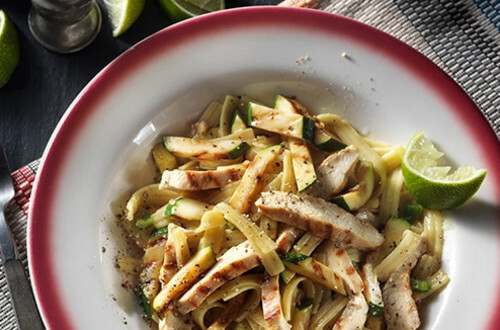 Serve chicken and zucchini with Pasta and, if desired, lime wedges.